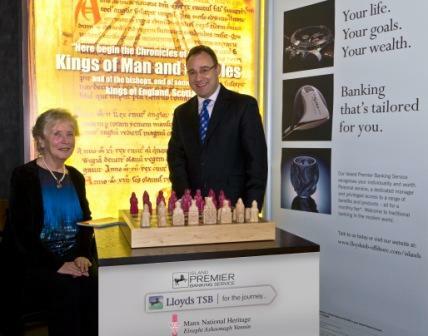 The arrival of the Lewis Chessmen has proven to be a popular attraction for visitors to the Manx Museum and for one lucky visitor in particular thanks to Lloyds TSB. The lucky winner was Mrs Greta Corlett, of Andreas who attended the official opening of the exhibition and has since made several return visits to the museum. The Forgotten Kingdom Exhibition is on display until 9 March 2013 and is open Monday  Saturday, 10am to 5pm at the Manx Museum.